Samsung Galaxy Tabs are very popular in Bangladesh already. They already sold huge number of tabs though original distributor and various importers. There are both advantages and disadvantages with imported version. They are offering same Samsung device at a significantly lower price than Samsung BD. But they are offering no warranty with any of the devices. After massive success of Samsung Galaxy Tab 7 tablet Samsung released Galaxy Tab 7.0 Plus and Galaxy Tab 2 7.0 P3100 over the past few months. 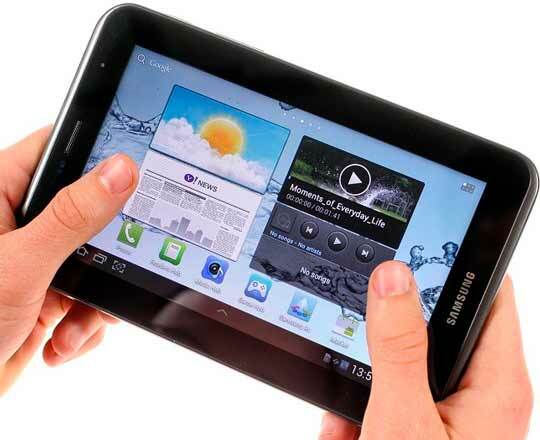 Galaxy Tab 2 7.0 was released back in April 2012 with a dual-core 1GHz CPU and powerful PowerVR SGX540 GPU inside. The tablet is only weighted 344 grams making it one of the lightest Android tablets in the market. It has 8/16/32GB built in storage with 64GB memory card support with each model. There is a 3.15MP camera on the back capable of shooting 720p HD video. Its battery is very powerful to supporting 40 hours of continuous 2G talk time and 1190 hours of standby time. Software section of Samsung Galaxy Tab 2 7.0 is more impressive. As you expect it is ran by Android 4.0.3 Ice Cream Sandwich OS. So I hope there is no confusion in your mind to create. In Bangladesh various stores offering the P3100 tab for 36,000 taka ($440). The price is not so bad considering its ability and GSM voice communication feature. In the meantime you have access over Amazon US products then you can go there. Because they are selling the same tab $399. So make your choice wisely.